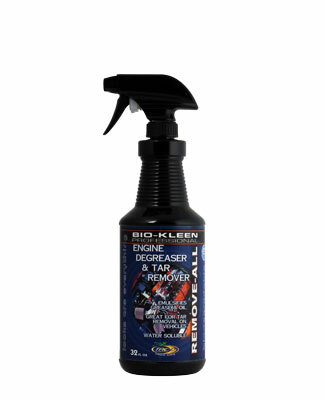 Bio-Kleen Remove All is an Engine Degreaser and Tar Remover. Quickly and effortlessly remove grease, oil and build up from hard to reach engine components. Safely remove road tar from vehicle. Cleans set in oil stains from concrete, driveway and garage floor. Powerful surfactants cut through the heaviest soil and grease build up. A water soluble emulsion degreaser. This is a fast acting engine degreaser that starts working instantly and rinses away freely with water. Will not harm the paint on the surface of vehicle or engine components. Engine degreasing, removing road tar from car, general degreasing, cleaning oil stains from concrete, driveway and garage floor.